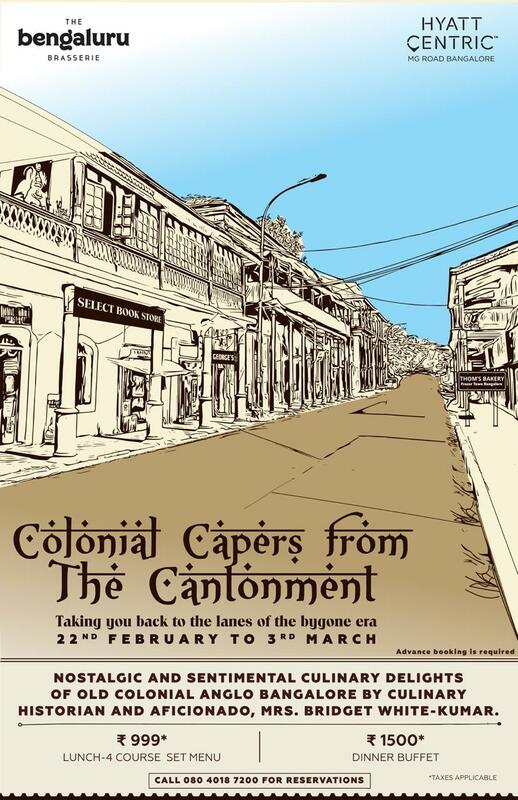 The Hyatt Centric, Bangalore is holding an Anglo-Indian Food Festival – ‘Colonial Capers from the Cantonment’ from 22nd February to 3rd March 2019 – bringing back Nostalgic and Culinary Delights of old Colonial Anglo-Bangalore at their Bengaluru Brasserie. 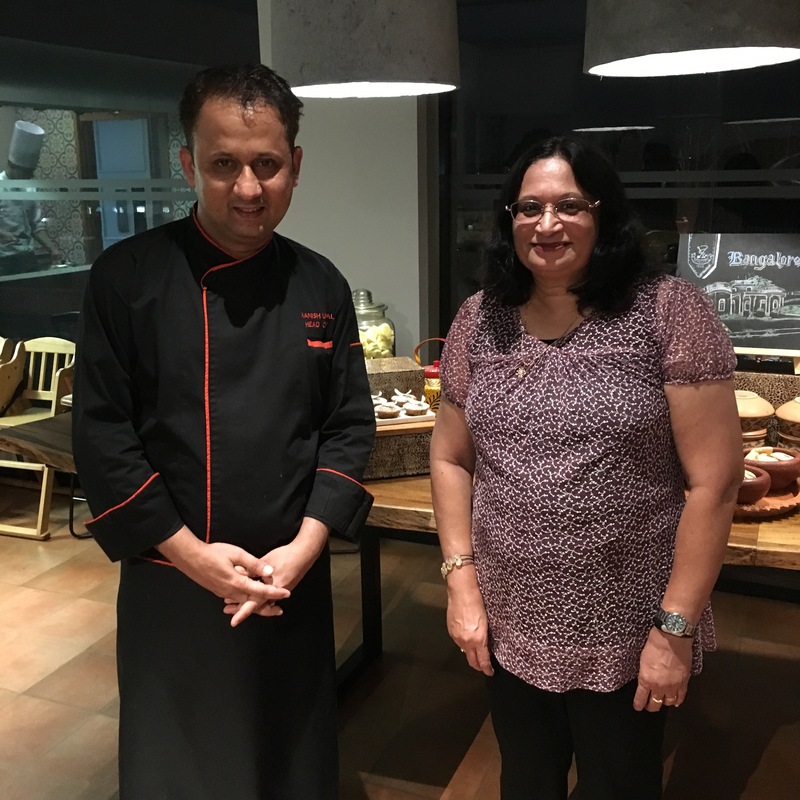 I am assisting them in bringing back to life the old Colonial and popular Anglo-Indian dishes that will take one back down memory lane of the by-gone Era. 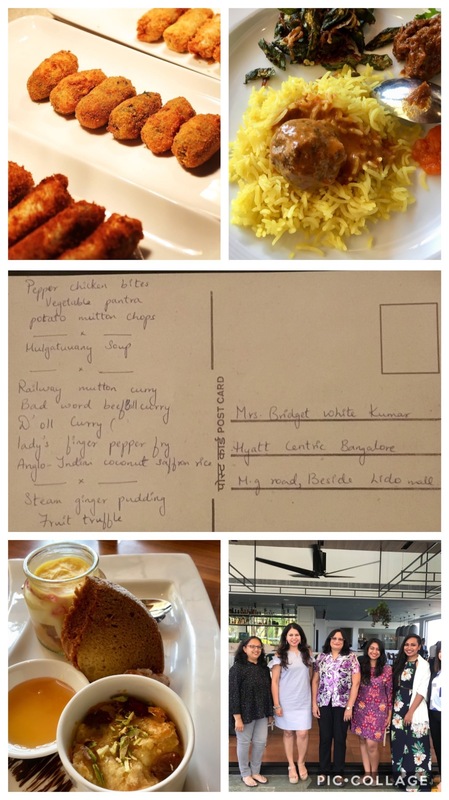 I have curated 5 special menus of the old popular dishes for a ’la Carte Lunches and Buffet Dinners. 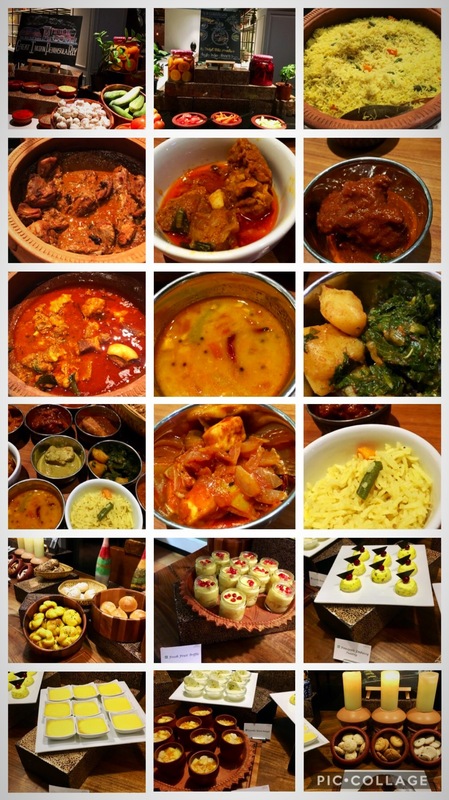 The special dishes from this festival include Colonial Dishes such as the Railway Mutton Curry, The Dak Bungalow Curry, Grandma’s Country Captain Chicken, Potato Chops, Colonel Standhurst’s Beef Curry, Pork Country Captain, Bengal lancer’s Shrimp Curry, Pork Bhooni, Meat Jal Frezie, Devil Pork Curry, etc, and typical Anglo-Indian Dishes such as Saffron Coconut Rice, Junglee Pilaf, Meat Ball Curry (Bad Word Curry), Devil Chutney, Doll Curies, Vegetable Curries and side dishes, etc. The Menu varies slightly each day both for lunch and the dinner buffet so that a wider variety of Anglo-Indian Dishes are featured. Starters were Pepper Chicken Bites, Vegetable Panthras (crumbfried panrolls stuffed with sautéed veggies) and lamb mince Potato Chops. 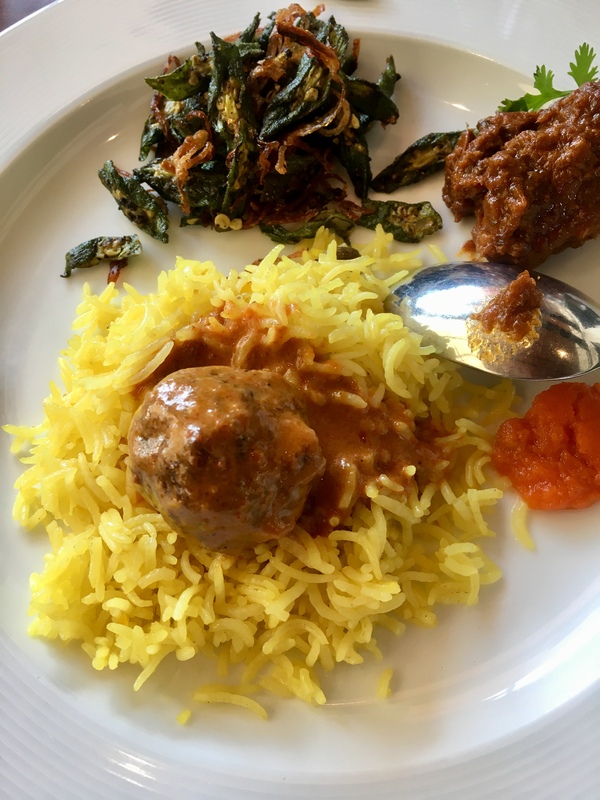 Mains took us to Railway Mutton Curry, Anglo-Indian Meat Ball Curry or Bad Word Curry, Anglo-Indian Doll Curry (Dhal was always pronounced as Doll by us), Pepper Ladyfingers Fry (Bandy Coy) and Saffron Yellow Coconut Rice) and White Steamed Rice. A selection of Anglo-Indian pickles and relishes and our very own Devil Chutney added zing to the meal together with short glasses of Anglo-Indian Pepper Water. The Superb meal was rounded off with a selection of desserts such as steamed ginger pudding, bread pudding, Trifle and Kal Kals served portion wise. Starters and short eats from the Live counter such as Pepper Chicken Bites, Corriander Chicken Nibbles, Cutlets, Lamb Mince Panthras, Vegetable Panthras (Crumb-fried pan-rolls stuffed with sautéed lamb mince or veggies) and lamb mince Potato Chops. 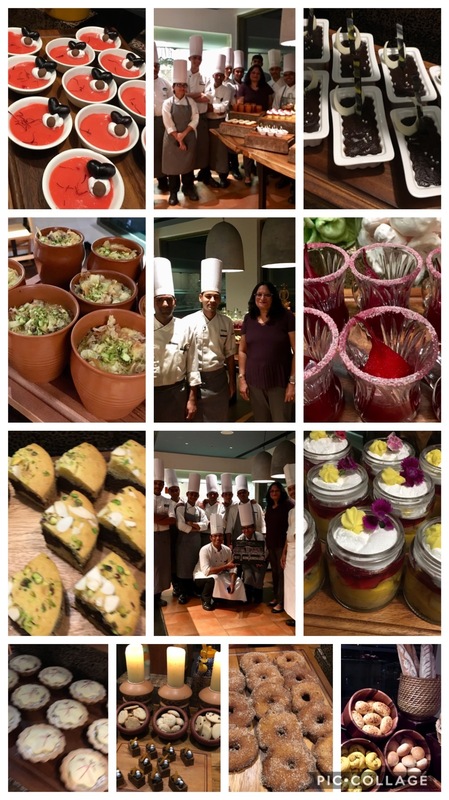 All credit goes to Chef Manish, Chef Babu Ram, Chef Debaditya and their team for their excellent interpretation of my recipes, and bringing out these old delicacies perfectly each day. Chef Manish adds his own special touches to make the whole experience memorable. Not forgetting Anum Ajani, Preetam Rai, and all at the Hyatt Centric Bangalore. Cook the Tur dhal with 2 cups of water till the dhal is cooked. Add the chillie powder, tomato, cumin powder, pepper powder, garlic paste, turmeric powder, coriander powder, tamarind juice, salt and some more water to the cooked dhal and bring to boil. Cook on low heat for a few more minutes. Season with mustered seeds, curry leaves and crushed garlic. Frikkadels or Frikadellers are a legacy of the Durch to Anglo-Indian Cuisine. Frikkadels are also known as Raw Mince Cutlets. Frikkadels are pan fried or braised meat balls or patties made with spiced ground meat or meat mince of either beef, lamb or chicken. Combine all ingredients together and mix well. Form the meatballs by rolling portions into balls and pressing down slightly to flatten them. Heat the oil in a non-stick frying pan and brown the meatballs on both sides. Reduce heat and cook until the meat is no longer pink. Grind the green chilies, coriander leaves, coconut, cinnamon, cloves, cardamom and cumin seeds to a smooth paste in a blender. Heat oil in a pressure cooker and fry the onions till golden brown. Add the meat, ginger garlic paste and turmeric powder and fry for some time. Now add the ground paste and salt and mix well. Keep frying on low heat till the oil separates from the mixture. Add the potatoes and sufficient water and pressure cook for 15 minutes. Serve hot. This curry is good with ghee rice or Palau rice. Grind the green chilies, coriander leaves, coconut, cinnamon, cloves, cardamom and cumin seeds to a smooth paste in a blender. Heat oil in a pressure cooker and fry the onions till golden brown. Add the meat and turmeric powder and fry for some time. Now add the ground masala and salt and mix well with the meat. Keep frying on low heat till the oil separates from the mixture. Add the potatoes and sufficient water and pressure cook for 15 minutes. Serve hot. This curry is good with ghee rice or Palau rice. The Railway Mutton Curry is a direct throw back to the days of the British Raj to as early as the early 1900s, when traveling by train was considered aristocratic. . This wonderful curry was first served on the long distance train (The Blue Train) between Bombay to Calcutta, and in the Refreshment Rooms on Victoria Terminus Station in erstwhile Bombay. It was presumably innovated by the Spencer’s Railway Catering Service at Victoria Terminus. As its very name suggests, this very popular and tasty dish was prepared and served in Railway Refreshment Rooms and only in First Class Cabins on long distance trains, with Bread or Dinner Rolls. The curry was not too spicy keeping in mind the delicate palates of the British. It was prepared with tender pieces of lamb or mutton, potatoes and other Indian condiments along with the addition of either vinegar, tamarind juice or yogurt to offset the spice as well as to to preserve the dish for the many hours of journey time. It was also popular with the Anglo-Indian Railway staff who had to be on duty for long periods at a stretch. The vinegar or Tamarind juice used in its preparation ensured that the curry would last for quite a few days and was an ideal accompaniment with rice as well. Boil the meat in a little water, salt and a pinch of turmeric till tender. Remove the boiled meat and keep the remaining soup aside. Heat oil in a suitable pan and fry the onions, red chillies and whole spices and pepper corns till golden brown. Add chopped tomato, ginger garlic paste, salt chillie powder, coriander powder and cumin powder and fry for a few minutes till the tomatoes turn pulpy. Add the parboiled meat and soup and mix well. Cook first on medium heat then on low heat till the gravy dries up a little. Now add the boiled potatoes, coconut, vinegar / Tamarind juice and simmer till the gravy is slightly thick. 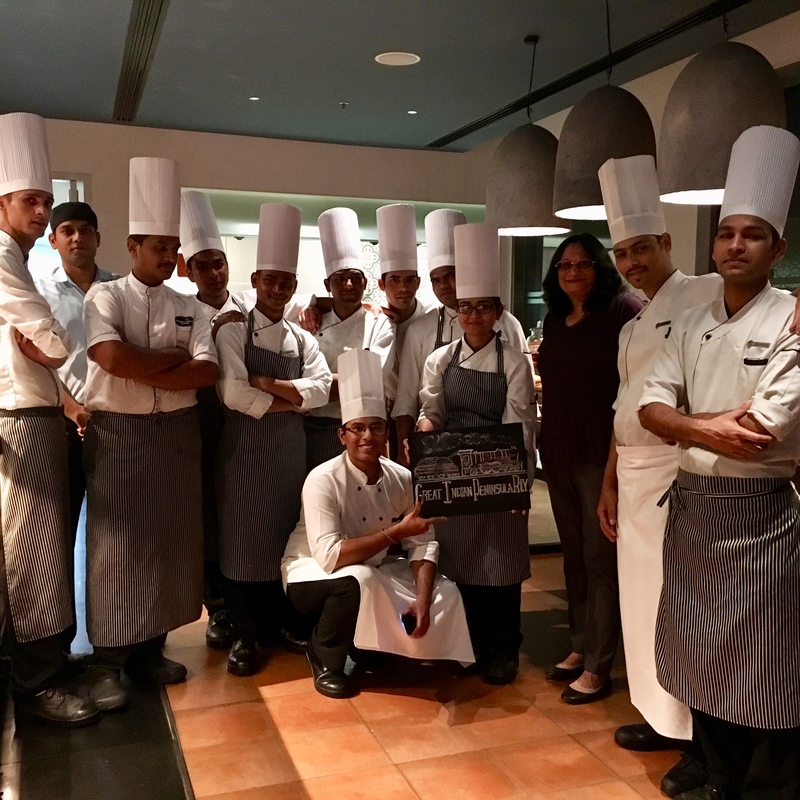 I have just finished a culinary training session in Colonial Anglo-Indian Dishes for the chefs and staff at THE OBEROI Mumbai. 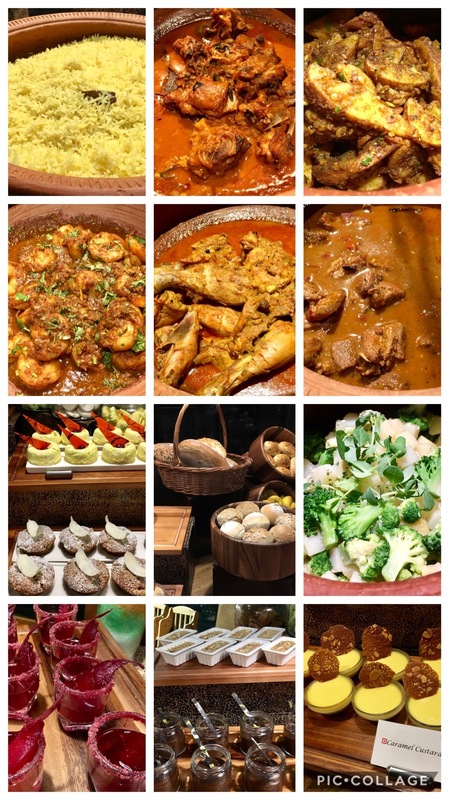 The Oberoi Mumbai is holding a Food Promotional Event showcasing the culinary legacy of the Colonial Past. With my knowledge and expertise in Colonial Cuisine, we recreated and brought to life forgotten foods and simple dishes of yore that were innovated and invented by the khansamas and cooks in those early days of the Colonial period. The rustic and robust flavours of dishes that were served by the cooks at the Dak Bungalows and Inspection Bungalows to the British Officers while on their official tours across the country such as the Dak Bungalow Chicken Curry, the Dak Bungalow Chicken Stew, Junglee Pilaf, Etc. The hearty Army Camp Soups and Curries that came out of the innovation and efforts of The Bengal Lancers Unit made famous by Col Skinner and Maj. Grey. The delicious Railway Lamb and Chicken Curries and the Cutlets that were first served on the Great Indian Peninsular Railway also known as The Blue Train that began its three day journey from Bombay’s Victoria Rail Terminus to Calcutta via Allahabad for the first time on 7th March 1870 covering a total distance of almost 4000 miles. Then the East India legacies of mulligatawny soup, lamb chops, roasts and bakes, Bread and Butter pudding and steamed ginger pudding, besides other dishes associated with British colonial cooking such as Kedegeree (the anglicised version of kichidi, a rice dish cooked with pulses then mixed with smoked or fried haddock and quartered hard boiled eggs), Fish Cakes and Rissoles, Potato Chops and Pantras, Cutlets and Croquettes (pronounced Cutlas and Crockit by the Colonial Servants). The Portuguese legacies of Vindaloo and Tangy Curries and Sweets, the Dutch Fish and lamb Mince Friccadels and not forgetting the French connection of Chicken in red wine, crumbed fried stuffed crepes and many, many more old dishes such as Grandma’s Country Captain Chicken, Hussainy Curries, Glassy, etc. The very names of these ‘Dishes with History’ evoke nostalgia and a longing for the old Colonial way of life. The recipes for all these dishes are featured in my Recipe Books. This is a small explanation on Colonial Cuisine. MEAT PEPPER FRY Meat pepper Fry is a favourite and popular meat dish that is prepared very often in Anglo-Indian Homes. Its often an accompaniment with Pepper Water and Rice or Dol Curry (Dhal) and Rice. Goes well with Bread or dinner rolls or a Chapattis as well. Its also the perfect dish when recovering from the flu Ingredients ½ kg Meat either Beef, Mutton or lamb (I used Mutton) 3 teaspoons fresh ground pepper 1/2 teaspoon turmeric powder 1 teaspoon chopped ginger 2 big onions sliced finely 3 tablespoons oil 3 large potatoes Salt to taste Wash the meat and keep aside. Wash the Potatoes, peal and cut into quarters. Heat Oil in a pan and sauté the onions and chopped ginger for a few minutes. Add the meat, salt, turmeric and pepper powder and mix well. Fry for 5 minutes on low heat turning the meat well till the pieces get firm. Add sufficient water and the potatoes and cook on medium heat till done. Continue simmering on low heat till all the water is absorbed and the meat and potatoes are brown. Serve hot with bread or rice.